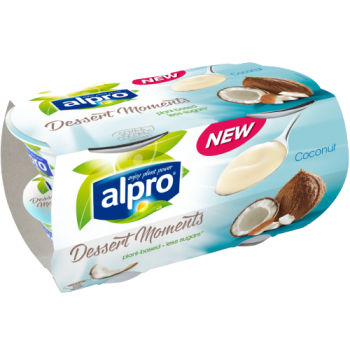 Take time out of your day to enjoy a Coconut Alpro Dessert Moments, made from coconuts and soya, and transport yourself to your own tropical island with every spoonful! Enjoy the creamy texture and fresh taste of real coconuts. Deliciously refreshing, subtly sweet and containing 30% less sugar, it’s a luxuriously exotic experience you can indulge in any time to brighten up a dull day. May contain traces of nuts (no peanuts). Contains soy. Free from dairy and gluten.